as the pathway to peace. "PUT A DING IN THE UNIVERSE!" Everyone is welcome! Bring your friends! Fantastic new movie by Ron Nix, famed Hollywood stuntman. Nix director, actor and producer, has planned this movie for 20 years! Pat Larkin, producer, actor and writer plays a very convincing sheriff. Kristina Wayborn, former James Bond girl, plays a bar owner and love interest of Pat's. Marty Kove just puchased another bar, but secretly works for the CIA. Bobbi Jeen Olson is Lexis, a troubled young woman who dances at the bar Krissy owns and isn't afraid to mix it up with the low lifes. Cole McKay, Frank Noel and Neil Summers play drug dealers. Spanky Spangler is a climbing instructor. The film introduces Daniel Hitchcock and Stephanie Dostal as Billy and Teresa. Sandy Gibbons and Linda Ray Jurgens are reporters. Plenty of other local talent can be seen in this film including Dewey Hopper, Sam & Cindy Meranto, Brad Zinn and many more. A complete list is below. The film was beautifully shot by Jonathan Able. Dramatically edited music by Rolli Stevens. Edited By Richard Lopez. A killer is on the loose! No one is safe! The Mayor is threatening to bring in the National Guard. The sheriff suspects a person who survived and disappeared from a mass killing 10 years before. And the Deputy is involved in so much rotten stuff you won't believe it! Order and pay as you like, but ask to be seated in the Ron Nix area. Looking to add some pretty pieces to your personal collection? The versatile and elegant designs from Cate & Chloe are now available on Amazon! Complete any look with the exclusive 18k White Gold Swarovski Collection – affordable, yet elegant jewelry that is sure to stand out from the rest. McKenzie “Charming” White Gold Earrings: Designed and created with the everyday woman in mind, McKenzie is a true standard to any busy girl’s accessory collection! Easily transitioned from day to night, these elegant earrings can go from the office to a date night with that special someone in a breeze. 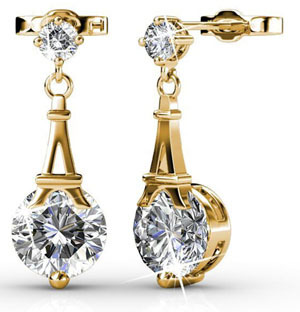 McKayla “Wondrous” White Gold Earrings: Attain sophistication with these magnificent white gold earrings! Dress up any evening with pieces that are superbly crafted and wondrous to look at with an effortless line of Gold Plated Swarovski earrings. Layla “Ruler” White Gold Pendant Necklace: The unique Laya pendant features a delicate, studded lining that adds a glimmer of sophistication to any outfit. 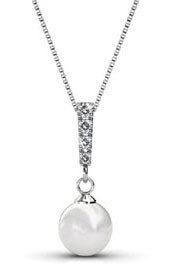 Complete your look with a special line of 18k Swarovski pendants. Isla “Ethereal” White Gold Pendant Necklace: Closely resembling the captivating beauty of the Eiffel Tower, the silhouette of the Isla pendant is just as unforgettable. Make any outfit original and adorable with this radiant, white gold plated accessory! It’s her special day, get her a gift that’s equally as timeless with the high quality, classic designs from Cate & Chloe! 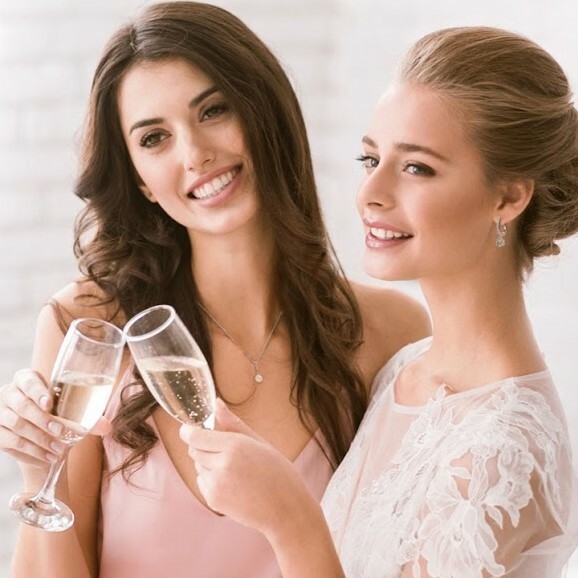 Whether you want to encapsulate the beauty of the new bride or get a gorgeous gift for your girls, Cate & Chloe has sophisticated pieces of jewelry that are as stunning as they are thoughtful. Gabrielle Pearl 18k White Gold Plated Swarovski Drop Necklace: Precious and perfect, this pearl necklace will help you stand out from the crowd! Featuring a row of Swarovski stones that fall into a pearl drop all set in 18k white gold plating, this pendant is sure to make a mark. 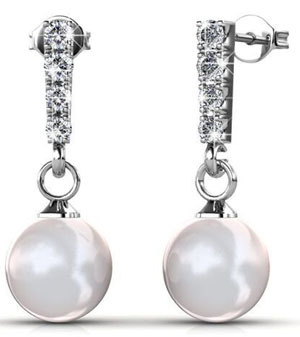 Gabrielle Pearl 18k White Gold Swarovski Drop Earrings: The definition of classic and elegant when paired with a line of Swarovski stones set in 18k white gold, these are guaranteed to turn heads and make you sparkle on the dance floor all evening! Isla “Ethereal” 18k Rose Gold Swarovski Earrings: Resembling the captivating beauty of the Eiffel tower, the silhouette of these Isla earrings are just as unforgettable. Dress up any event and complete your wedding look with this special line of Swarovski earrings. Isla “Ethereal” 18k Rose Gold Swarovski Pendant: Incorporating the glam and glitz of the Eiffel Tower, this perfect pendant is a great, unique gift for the bride or her tribe. The best wedding jewelry for every neckline, accessorize for your big day with Cate & Chloe! Cate & Chloe is a growing company who continuously strives to provide women with high quality jewelry fit for their budget. They carefully hand select every piece to ensure it meets the standards of the Cate & Chloe vision for timeless design. What is being done to safeguard grizzly bears now? What is being done to get toxic flame retardants out of children’s furniture and other products?